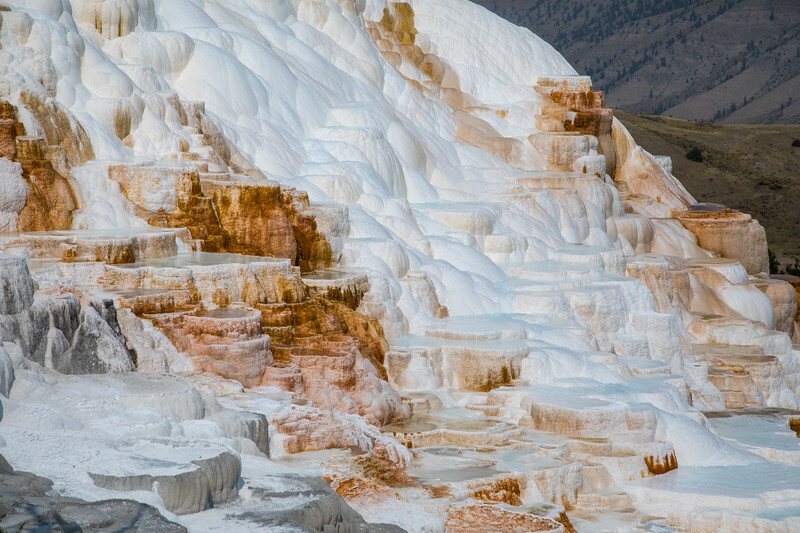 The highlight of the Mammoth Hot Springs for me is the Canary Hot Spring, which looks like an icy slope, but is actually steaming hot. The colors are striking. Trees don't do too well on the main terrace, once the thermal vents or corrosive waters reach them. 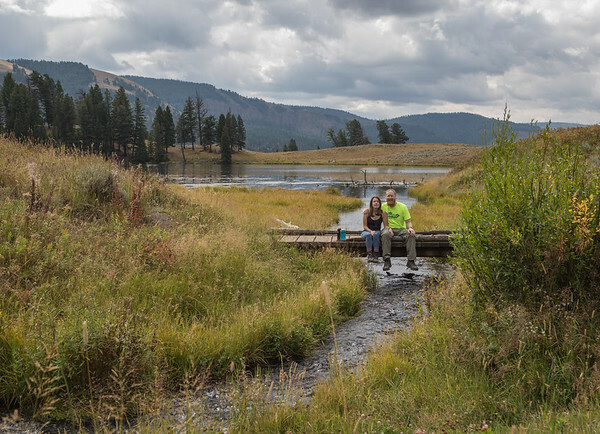 According to Montana State University: Sour Lake, named for its acidic or "sour" water, may look like a pleasant swimming hole, but its water would burn your skin like battery acid. 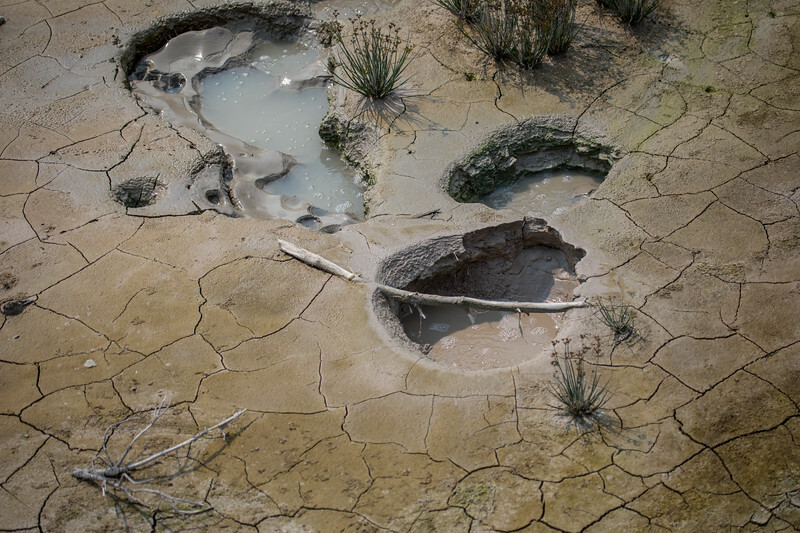 Most of its acid comes from microorganisms that create sulfuric acid as they consume sulfur. These microorganisms also give the lake its color. The smell, color and acidity didn't seem to both the herd of bison who proceeded to drink from it. 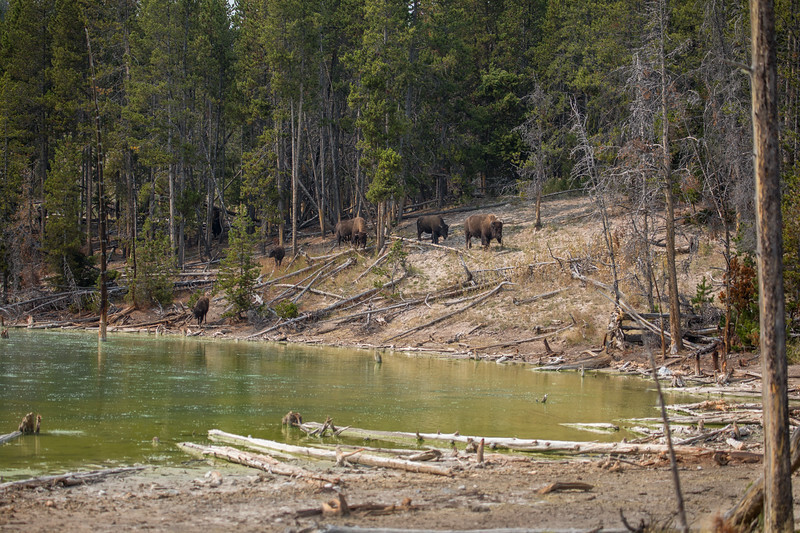 The bison didn't seem to mind the putrid, green, sulpher smelling water, but I would not recommend you taking a drink. 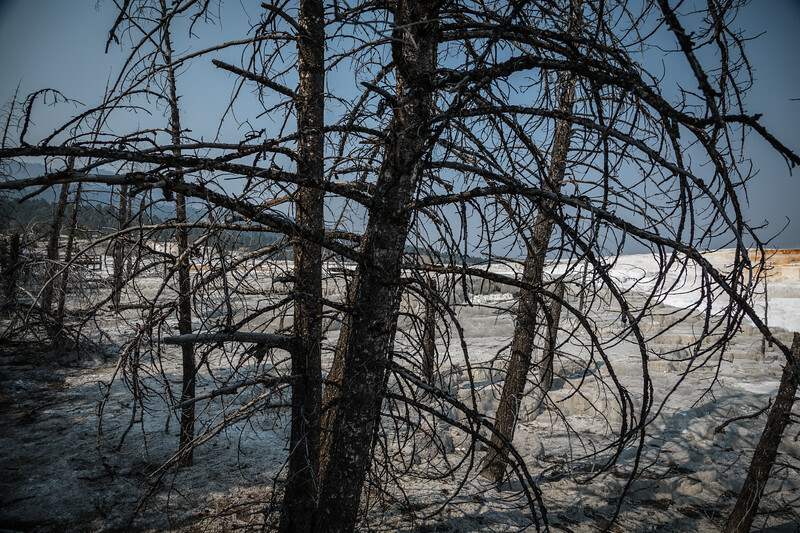 According to Montana State University: Sour Lake, named for its acidic or "sour" water, may look like a pleasant swimming hole, but its water would burn your skin like battery acid. Most of its acid comes from microorganisms that create sulfuric acid as they consume sulfur. These microorganisms also give the lake its color. 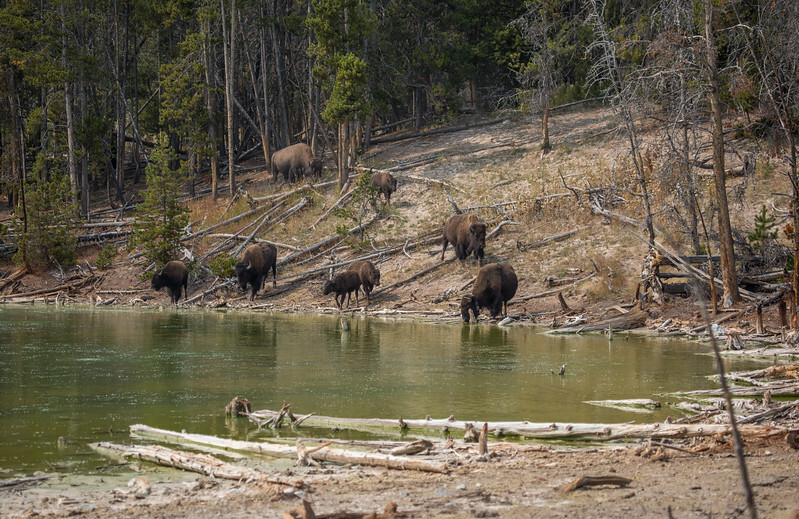 Near the mud volcano, the bison don't seem to mind walking across the hellish landscape. 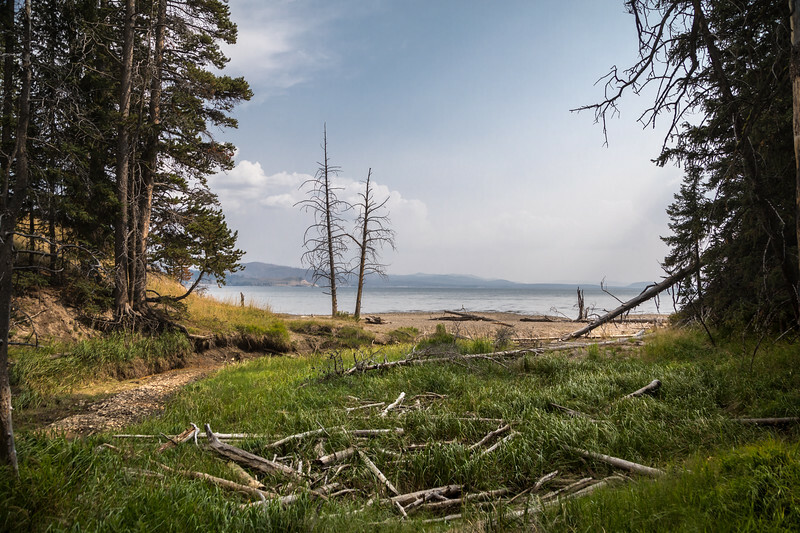 A view of Yellowstone Lake from the Storm Point Trail, with a distant thunderstorm. 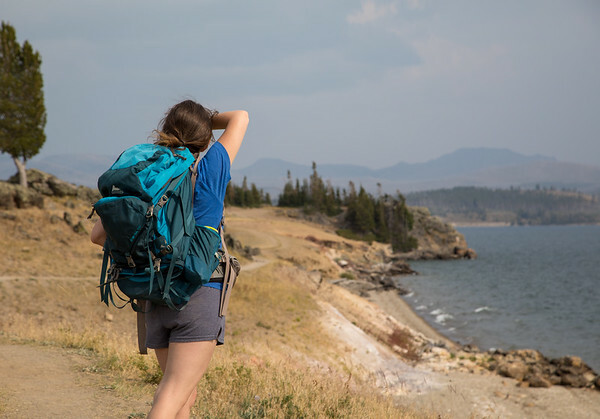 Bri looking back towards Storm Point on Yellowstone Lake. 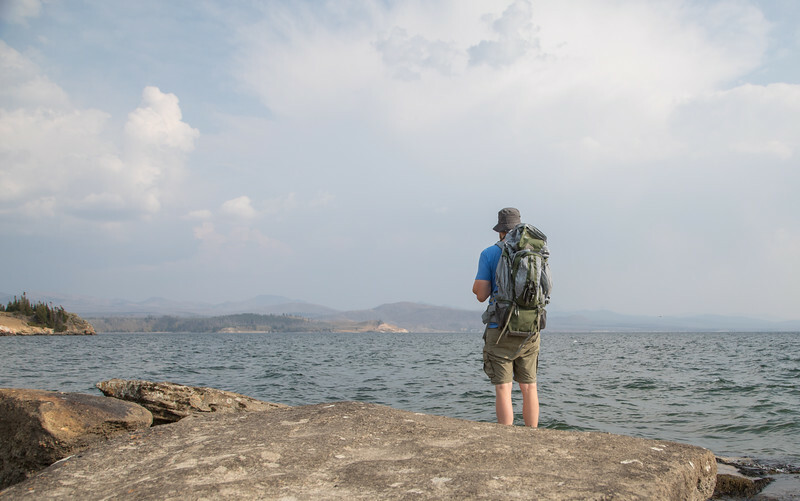 Me looking out towards Storm Point on Yellowstone Lake. Rain and thunder in the distance helped to clear the smoke from the sky the next couple days. 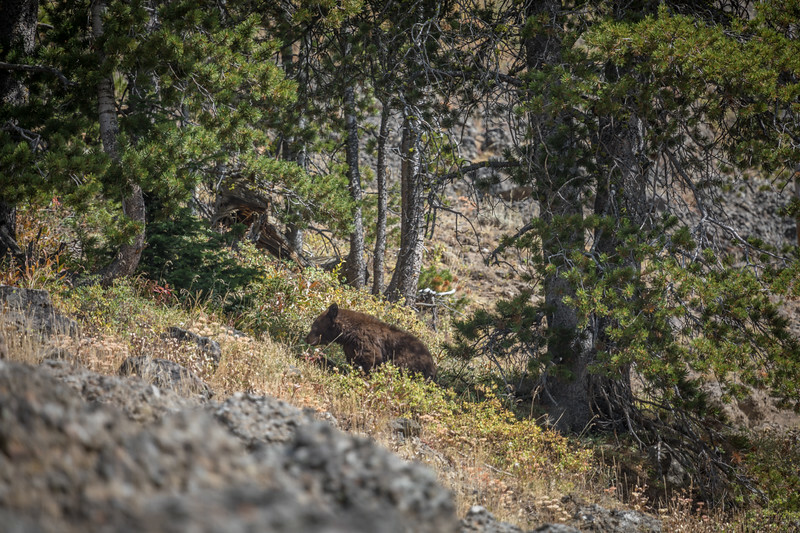 This black bear was foraging for berries or flowers below Mt Washburn, near Dunraven Pass in Yellowstone National Park. 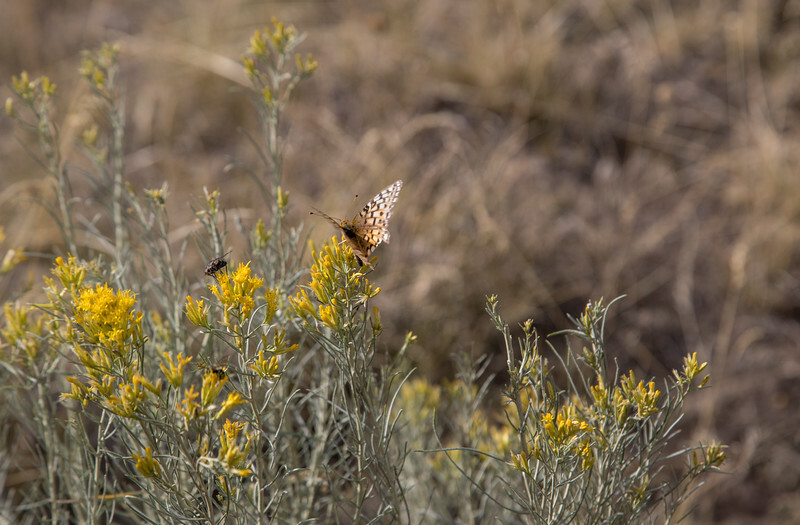 On the Hellroaring trail, between the terrifying Yellowstone River suspension bridge and Hellroaring Creek, came across this beautiful golden butterfly (Speyeria?) next to a wasp-looking robber fly (Coleomyia?). 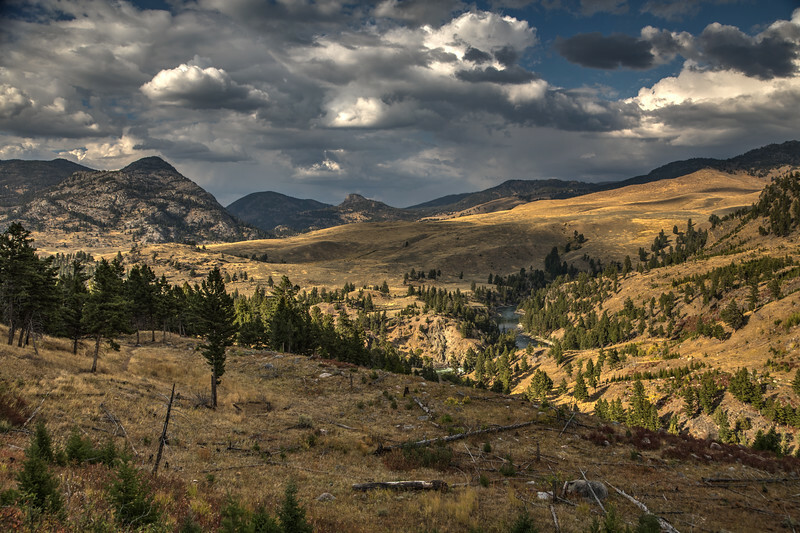 Overlooking the Yellowstone River along the Hellroaring Creek Trail. 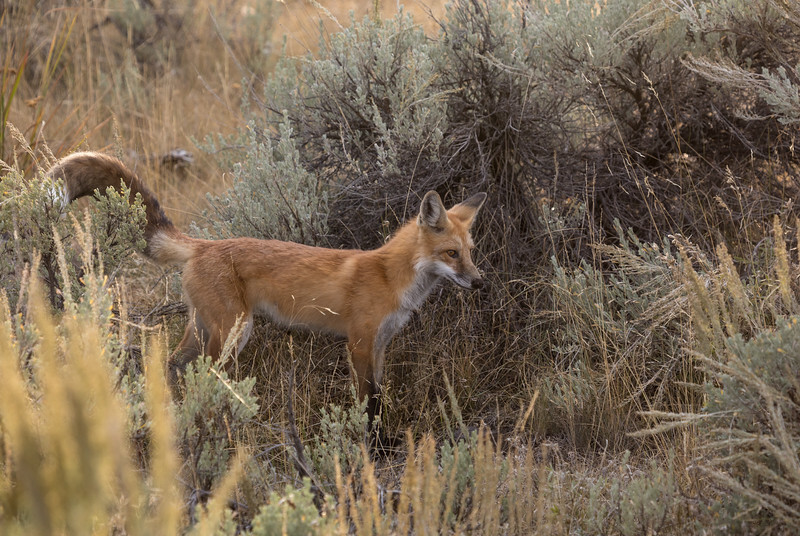 A red fox hunting for (and catching) rodents just outside of Tower Junction on our way into the Lamar Valley. She was listening for mice or voles with her big ears. 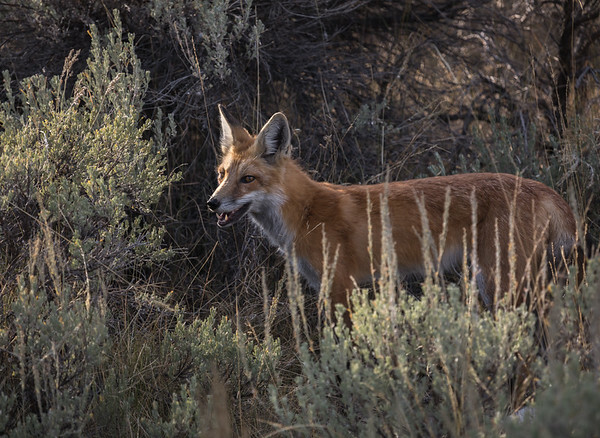 When she would lock onto one or a nest, she would attempt to dig them out from under the sage. Sometimes she would have to dig for minutes, taking periodic breaks, until one would run, then she would chase it down. Other times she would sneak up and spring into the air before landing on one. She did this for some time, ignoring the mass of people that had gathered on the roadside to watch. We watched for about 10 minutes before she started to move along towards the picnic area not much further up the road. After crawling around under some sage bushes while hunting rodents, it probably felt good to loosen up and get those ears cleared. 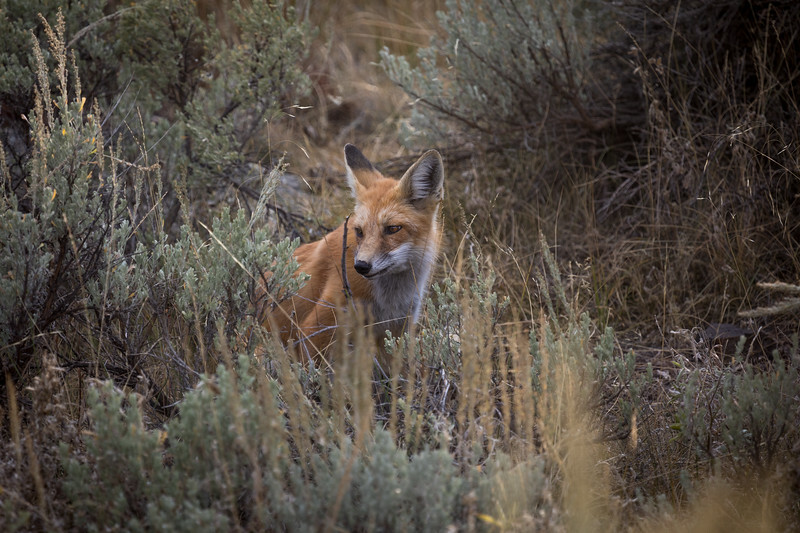 A red fox hunting for (and catching) rodents just outside of Tower Junction on our way into the Lamar Valley. 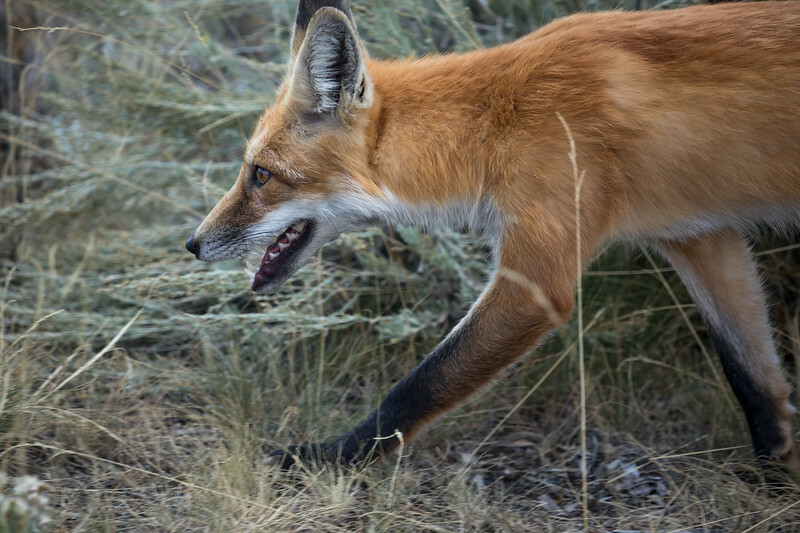 She was listening for mice or voles with her big ears. When she would lock onto one or a nest, she would attempt to dig them out from under the sage. Sometimes she would have to dig for minutes, taking periodic breaks, until one would run, then she would chase it down. Other times she would sneak up and spring into the air before landing on one. She did this for some time, ignoring the mass of people that had gathered on the roadside to watch. We watched for about 10 minutes before she started to move along towards the picnic area not much further up the road. Locked on. She caught some movement with her ears and was now looking for the source. 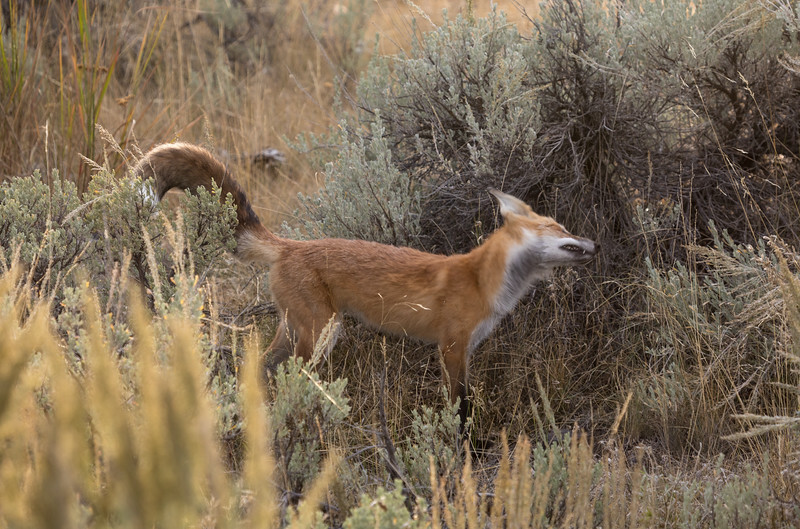 A red fox hunting for (and catching) rodents just outside of Tower Junction on our way into the Lamar Valley. She was listening for mice or voles with her big ears. When she would lock onto one or a nest, she would attempt to dig them out from under the sage. Sometimes she would have to dig for minutes, taking periodic breaks, until one would run, then she would chase it down. Other times she would sneak up and spring into the air before landing on one. She did this for some time, ignoring the mass of people that had gathered on the roadside to watch. We watched for about 10 minutes before she started to move along towards the picnic area not much further up the road. Taking a quick break on the creek feeding into Trout Lake in Yellowstone National Park. 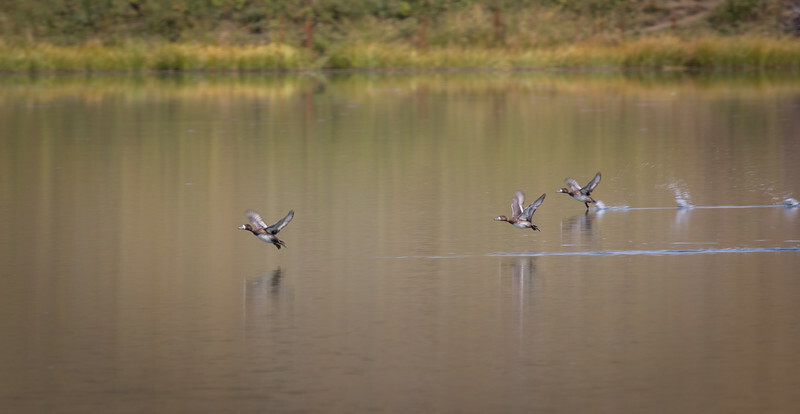 What I believe are a flock of Scaup, taking off from Trout Lake in Northeastern Yellowstone National Park. 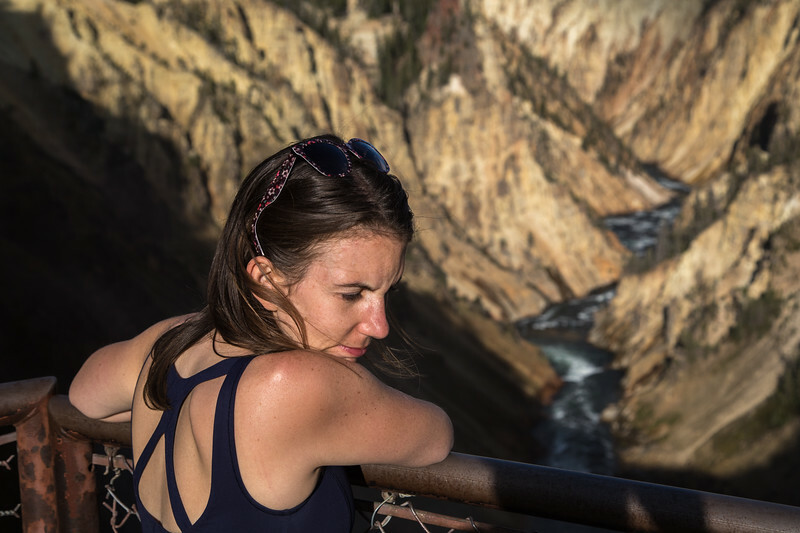 Bri looking over the brink of the lower falls, towards the Grand Canyon of Yellowstone. 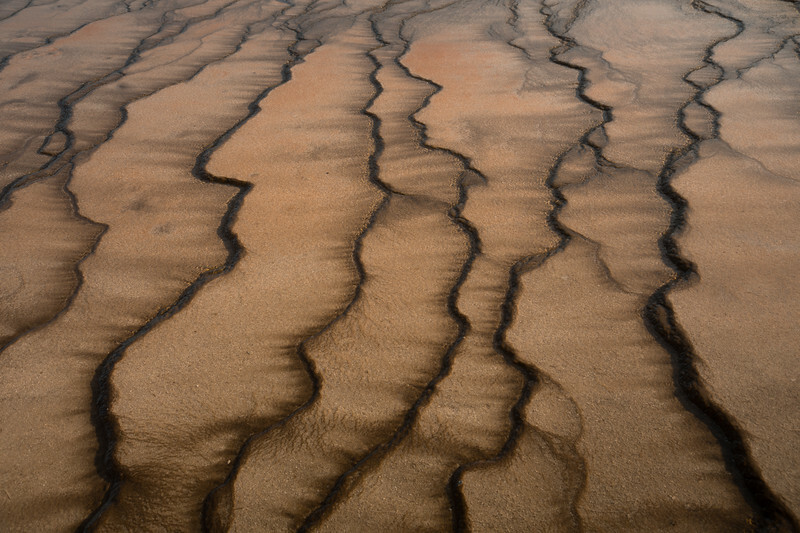 I think parts of the Grand Prismatic Spring's microbial mat resemble sand dunes.